Buzz-worthy Britons, The Vaccines, are set to release their highly anticipated debut, What Do You Expect From The Vaccines? via Columbia Records May 31. Coming off the heels of their highly praised U.K. release, The Vaccines will be bringing their guitar anthems to the stage beginning May 17th in Washington, DC supporting the Arctic Monkeys. From a cover feature with NME to entering the UK charts at #4 with What Do You Expect From The Vaccines?, The Vaccines are positioning themselves to be one of the most watched bands this year. The band, consisting of Justin Young (vocals), Anri Hjorvar (bass), Freddie Cowan (guitar, younger brother of Tom from The Horrors) and Pete Robertson (drums), has drawn caparisons to greats such as The Ramones and The Smiths. The Star Tribune has described the band's 2011 SXSW performances to be “disciplined, energetic and toweringly melodic…”. 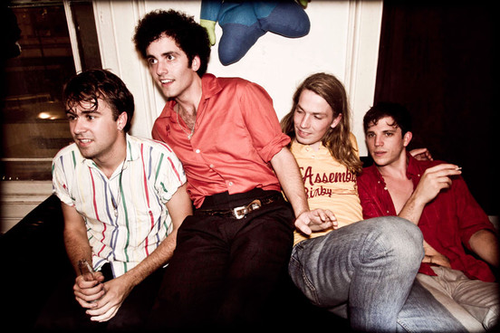 Furthermore, praise came from the Chicago Tribune which stated, “The Vaccines, delivered the kind of set that should be required by law at music festivals with 2,000 bands clamoring for attention.” It's becoming clear The Vaccines are ready to make their mark in the music scene. In addition, while Stateside, The Vaccines will be making their American network television debut on the Late Show with David Letterman on Tuesday, June 7th. The Vaccines full touring schedule can be viewed below. Album: What Do You Expect From The Vaccines?